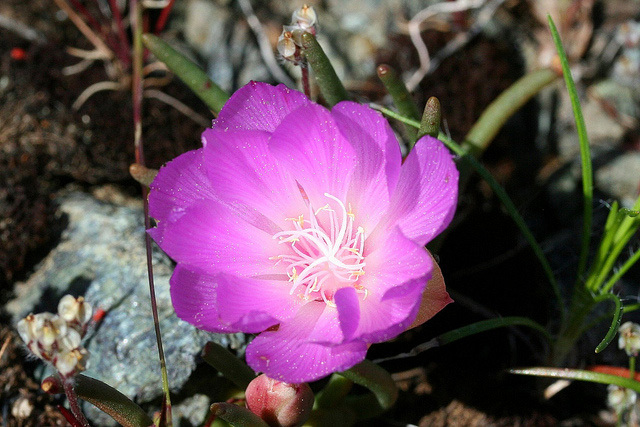 Bitterroot flower (Lewisia rediviva); photo by David A. Hofmann on Flickr (noncommercial use permitted with attribution / no derivative works). Bitterroot can be found during spring and summer, growing in the sagebrush plains and the foothills of the mountains in western and south central Montana. Native Americans such as the Shoshone and Flathead Indians used the roots for food and trade. The bitter root of the low-growing perennial plant was cooked and usually mixed with berries or meat. The Lemhi Shoshone believed the small red core found in the upper taproot had special powers (notably being able to stop a bear attack). Explorers Lewis and Clark wrote about the beautiful purplish-pink flower of the bitterroot. The Bitterroot Mountains (which form the divide between Idaho and Montana), the Bitterroot Valley, and the Bitterroot River all owe the origins of their names to this flower. 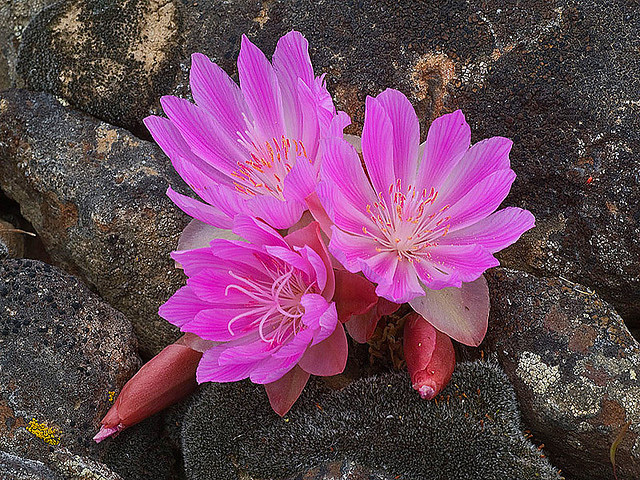 Bitterroot flowers (Lewisia rediviva); photo by Richard Droker on Flickr (noncommercial use permitted with attribution / no derivative works).